Until we made this list, it was largely believed that cats are incapable of love. From ruining your life in general, to rubbing their four feet in your face, cats have a reputation for being stone-cold killers. But not these cats. Expertly-placed secret video cameras caught these cats getting ready for Valentine's day, and what you see will shock you! Yes, you are about to see cats being kind to one another. 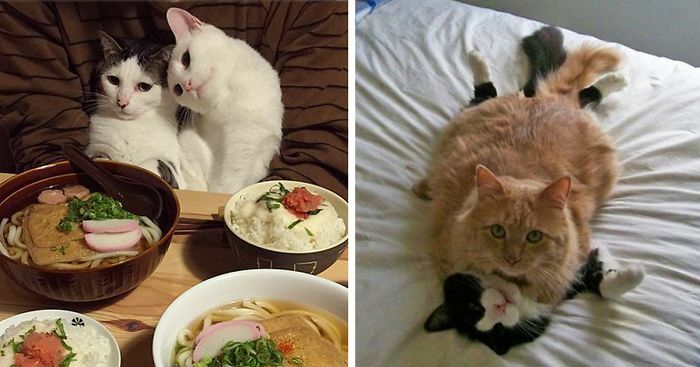 Which of these cat-couples is most convincing? Vote on your favorite couple below, or if you've caught a pair of cats in the act, submit your photos! Super. Really going the extra mile. Looks like true Kitty Love! OMG seer sucker sheets! Forget the cats, where did they find those sheets? #7 Yeah, nice... And who invented knocking on doors? Oliver! How did you get out, and WHO is THIS? #11 Could you take a picture of us, ma'am? Oh Mr. Shakespeare, we have a story for you! #13 Hello, dear, how was your day? Can't be a mirror-- the noses don't hit at the same spot. I think that's spelled keeees you. Oh God, this one made me cry!! #24 My Two 10-year-old Cats Are Brothers And Love Each Other More Than Anything! My boys love each other, too! #25 Look, who's winning the race! Send them to me, please. #30 Yes, she's my girlfriend, so what? Whadda you, anyway --- a racist or somethin'? Beautiful photo!....I love ginger cats!!!! Hahahahahah what else would they walk in? Leaps? Heart? Mmmhhhh, yeeeeah.... Lokks more like pretzel to me, but that too. #35 Can I kiss you, mademoiselle? Oh, those romantic French men! #36 Not Enough Room For The Two Of Us! Someone is hogging the sink. Oh, I love it -- and the caption! Been there. Oh, for those days again! I want to be kissed like that cat. Why are you watching us EVERY night?? Those are my cats! Fei Jai and Sadie. Unfortunateky Fei Jai is no longer with us. #47 Oh, John, you're so romantic! She's seen too many Myrna Loy movies. Wonderful "eye makeup" on that tabby! #52 What a nice day, shall we go to the park? Yes indeed, my dear! We shall! Now wash behind your ears, dear, and between your toes. Is he a maneki neko? Or just a stone kitty? I hope the kiss makes him real! #59 Hey! Give Us Some Privacy! Nice composition. A ménage à trois? #66 Sometimes Kittens Need A Chaperone. #73 Can You Help Me? #74 Reese's & Donnie Ray, Adopted From He Streets One Month Apart Love Each Other!! #77 Wait, Let's Do A Family Potrait First!